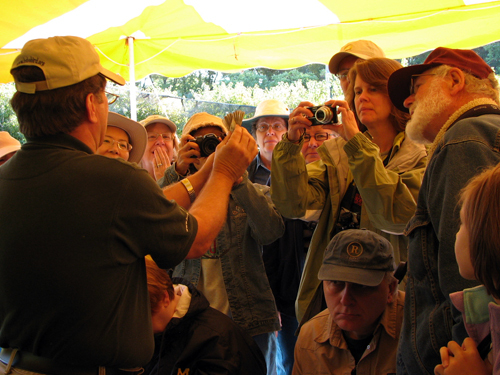 In addition to the great speakers and the interesting workshops, other special activities were offered to attendees of the Midwest Birding Symposium. 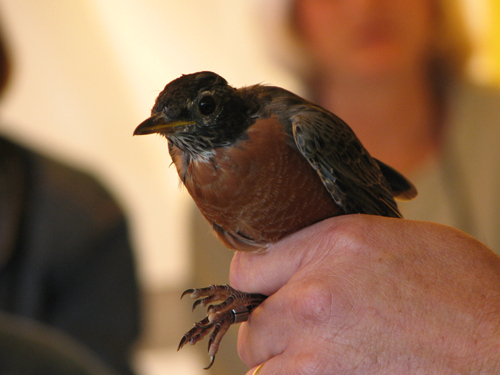 On Saturday morning we went to one of these, a songbird banding demonstration at Black Swamp Bird Observatory. 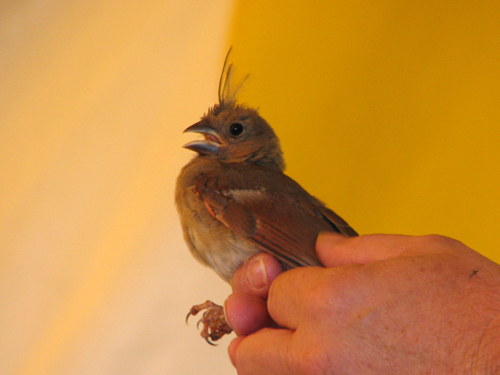 A good variety of birds were captured in the mist nets, and we got to see lots of birds in the hand. 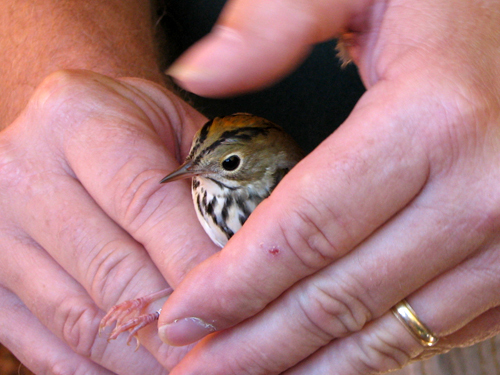 See the orange feathers on the Ovenbird’s head? 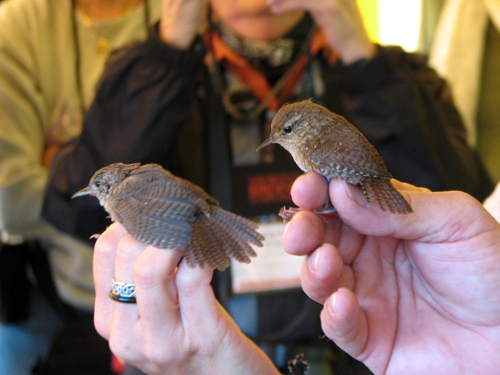 One neat thing was to see a House Wren and a Winter Wren side by side. Do you know which is which? Another cool thing was to see how they weigh the birds. At the MAPS banding station at Rollins Savanna, the birds are weighed by hanging the bird, still in the bag, on a hanging scale. 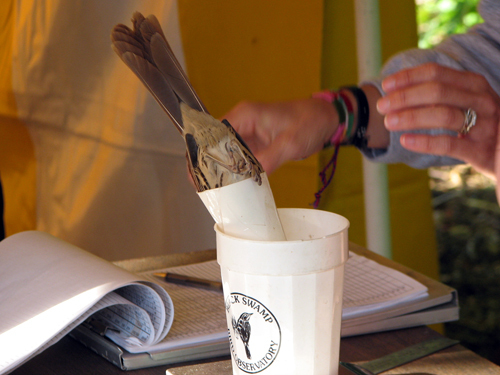 At BSBO the birds were placed into a cone and then weighed in a cup standing on a scale. At one point several different thrush species were being banded, and we were shown three of the birds up close to see distinguishing markings that are difficult to spot in the field. The best part of this demonstration, for me, was releasing a bird. I was minding my own business, taking photos of birds in the hand, when suddenly Dana Bollin was standing next to me, instructing me to hold my fingers just so – in order to take a bird to be released. Well, it all happened very fast and I don’t even remember which thrush it was, but it was pretty awesome. This entry was posted in Banding, Midwest Birding Symposium. Bookmark the permalink. So cool. Thanks for sharing and sorry I missed meeting you at Lakeside. Great post! I was excited I identified the winter wren correctly after seeing one for the first time last Fri. It’s the stripey eye that gives it away. Nancy, I can’t believe I missed meeting you! Well, actually I can. I missed a lot of people I wanted to meet. The weekend went by so fast. Hopefully next time! Jennifer, thanks. For me the size of the tail gives it away. I couldn’t believe how small both of them were.